Join us in ending hunger by donating $5.00 to support feeding 75-100 children in a small fishing village in Cangumbang, PI. $5.00 = 1 month rice subsidy for 1 child. 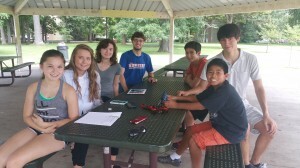 Today my family went to a local park; we met up with friends to do a type of dance called a line dance. It was pretty fun, and it was good exercise. When it was done, we took some pictures and went to get some ice cream. After that, we all went home. I don`t usually like dancing, but this was really fun! So if you’re reading this then remember that it’s always fun to do something you’re not used to doing! It has been a wonderful year for Hope For Haiyan. We managed to host three events to raise awareness for the Phlippines. In June, we had a fundraiser party where we introduced our dance, had a buffet of Filipino foods, and showed the Filipino culture. In September, we had a s’more party to raise awareness. In October, we had a costume party on Halloween to once again raise awareness and have a little fun. Through our donors and our own personal contributions, Cangumbang threw a Christmas party including games, food, and fun. 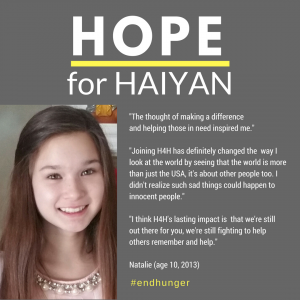 Hope for Haiyan has come along way and recruited many members since November of 2013 when it was only an idea. Hope For Haiyan, here’s to a great year and many more! Typhoon Ruby, also known as Hagupit has hit the eastern part of the Philippines. It’s a category 4 typhoon, almost a category 5. It’s heading for Tacloban, the same place Typhoon Haiyan hit. My only hope is that God can help them try to get through this disaster when it hits. I hope to raise enough money to help them once again, and raise even more awareness on how hard they have it. Our thoughts are with all the people in the Philippines, and we’re still trying, and all we can do now is pray.